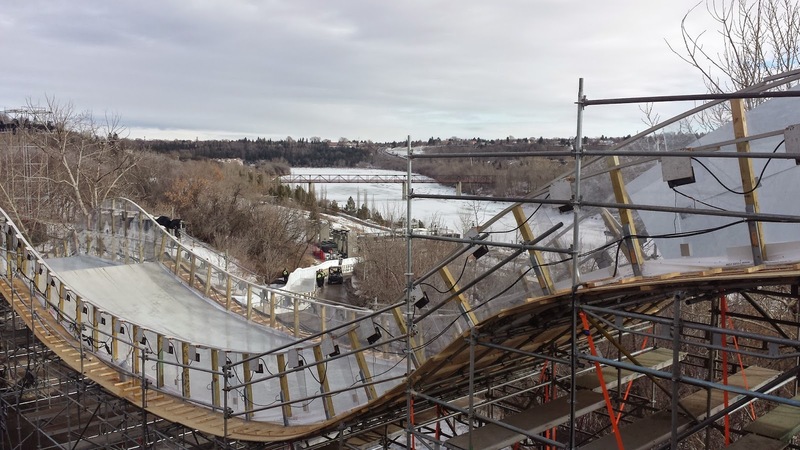 Red Bull Crashed Ice (or, "Red Bull Crushed Ice" as my coworker keeps annoyingly calling it) is coming to Edmonton for the first time ever this weekend. 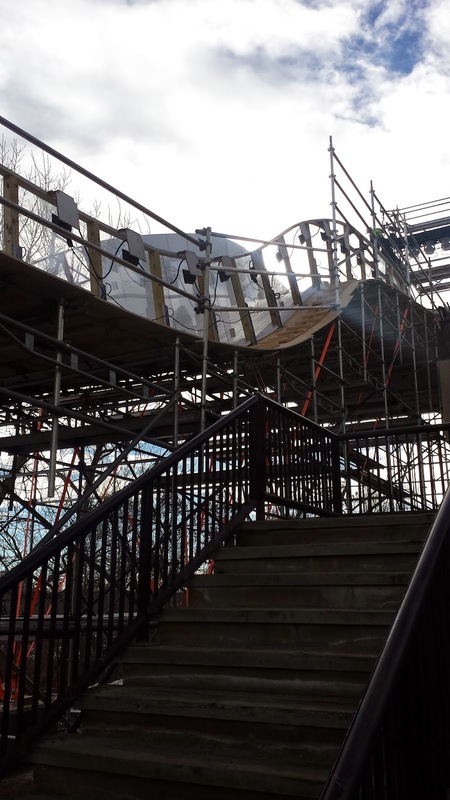 I took a few photos of the track in progress last week, which I'll post below. But so far the big story has been the unseasonably warm weather and what the impact on the event might be. 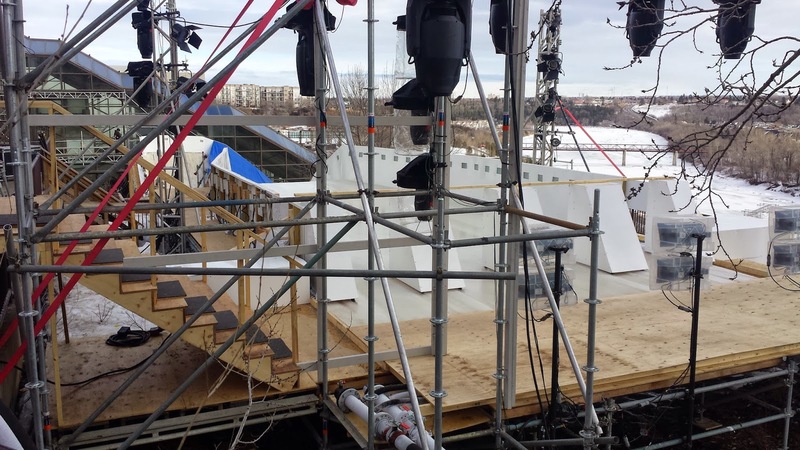 Crashed Ice uses a refrigeration system to keep the track icy. I've seen a similar one in operation for the skating rink at Rockefeller Centre in New York City. 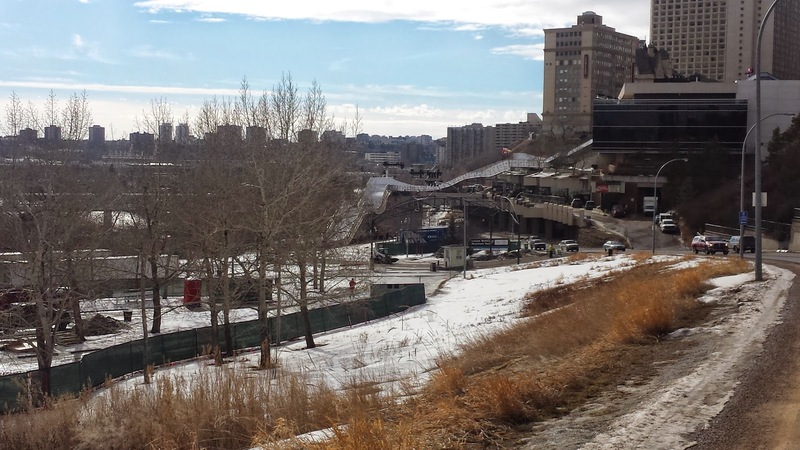 When I was there in 2013, people were able to skate despite it being +22 degrees Celsius on December 22nd. Having seen the system "plugged into" the course, I wasn't remotely worried about the ice conditions, but a lot of people were. Oh calm down everyone, Edmonton is basically the coldest city on the planet. 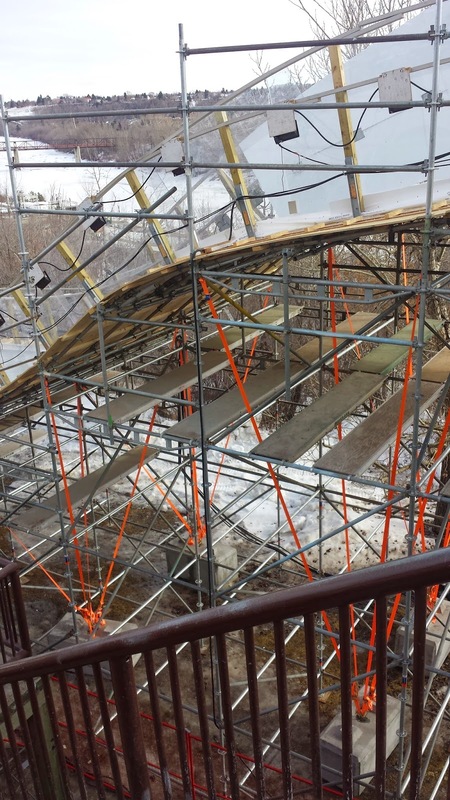 Crashed Ice has been in Germany, Holland, and Northern Ireland so they've had to deal with warm weather before. You might think that, at first glance, but it turns out not to be true. Yes Crashed Ice has been to Valkenburg, Niagara Falls, and Lausanne. They had events in Munich (which is, it's worth noting, at Edmonton's latitude). But they've also been in Moscow, Helsinki, and Sweden. Their U.S. stop was in Minnesota which isn't exactly known for balmy winter weather. 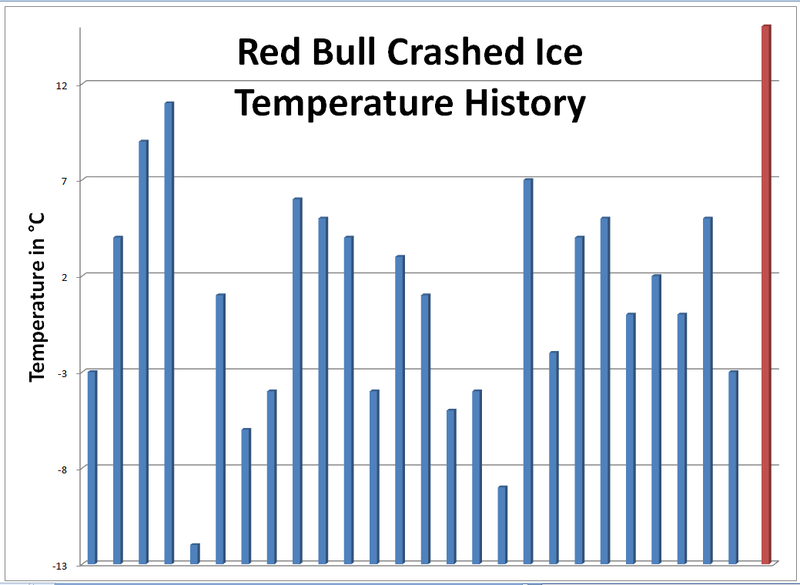 Note a couple caveats: I picked the daytime high for each day that Red Bull Crashed Ice took place. Since the events take place in the evening, the actual temperature at racetime will almost certainly be lower. It does indicate what the track would be like. 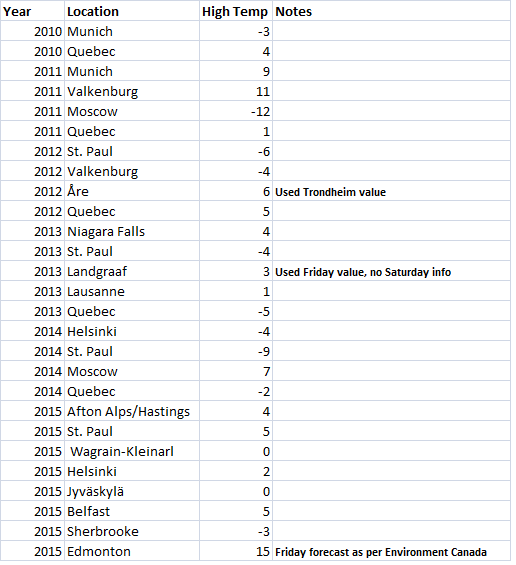 I also had to use the value for Trondheim, Norway for the Åre event in February 2012, since Åre doesn't have any historical data available (all figures are from weatherunderground.com). Landgraaf Netherlands in 2013 hosted a Crashed Ice event on Saturday February 9th, however no temperature data is archived for that day: I used the high on Friday February 8th instead. Finally, obviously, Edmonton is still just a forecast: I picked the forecasted high of +15 for Friday. The Saturday high is only +12. 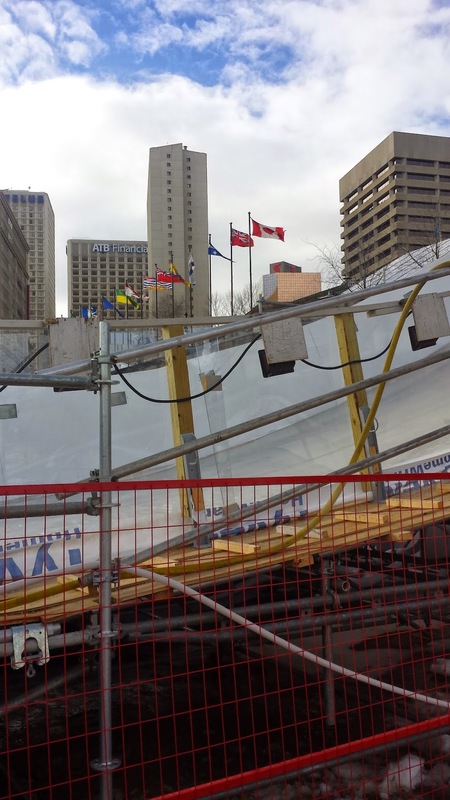 Edmonton is the hottest temperature in Red Bull Crashed Ice history. It's funny, but there it is: never since Crashed Ice started running in 2010 has there been a daytime high for an event above +11. The lowest temperature was of course Moscow, but St. Paul was right on their tail. 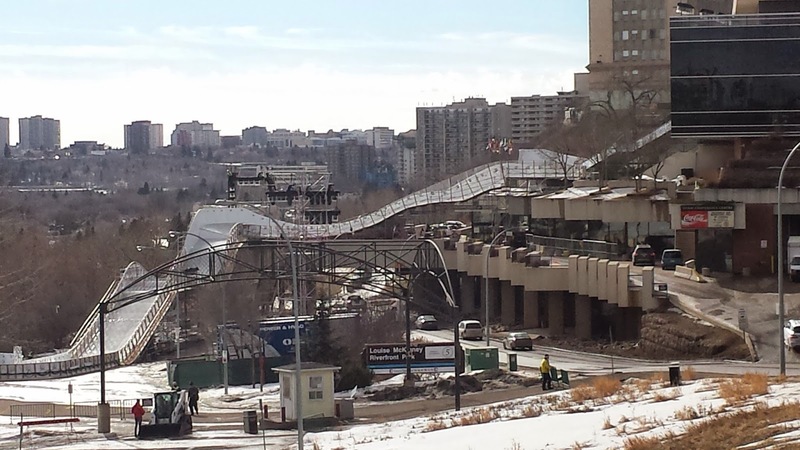 If the forecast holds, Edmonton will be setting a new Crashed Ice record on the thermometer, even if the crowds don't. 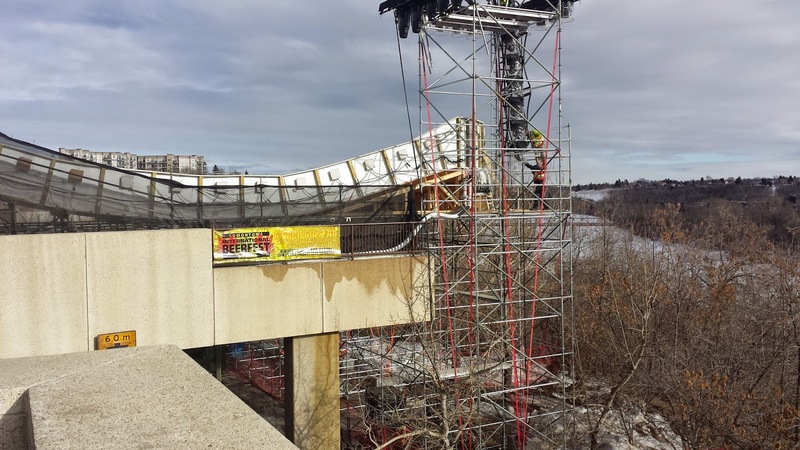 Update, 3:57pm: CTV weatherman Josh Classen notes that before 2010 Red Bull did do Crashed Ice-style events on a smaller scale. @FACLC yep! it's also only the "World Championships" era. there are single run events dating back to 2001.